in the beginning of the month, i mentioned that i was going to do the whole30 program. much like everybody else after the holidays, i needed a detox from all the garbage i’d been eating the last few weeks. it didn’t work for me right now. but it will work for me. let me explain. 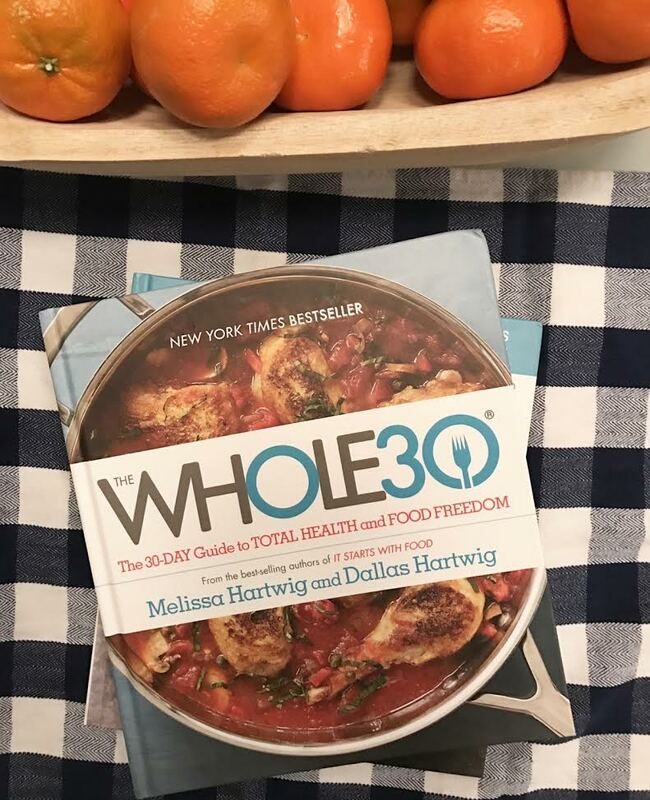 one of my blogger friends mentioned that she was going to try out whole30 in january and wanted to know if anyone wanted to join her. so of course i wanted to jump on board because i DID (and still DO) want to just get back into the swing of eating healthier. but i did jump into this quickly. i decided on december 30 that my husband and i were going to start doing whole 30 on january 3rd. that didn’t allow much time for into reading up on it, finding recipes, planning out the upcoming weeks for meals, shopping, and prepping food. but i wanted to make it work for us so i skipped the researching and simply found the recipes and shopped for what we needed. i didn’t get a chance to clean out the pantry or the refrigerator and just assumed we wouldn’t be tempted. the first five days went okay. i wouldn’t say they were great because that morning coffee of mine always has cream and sugar in it and now it couldn’t but okay, not that big of deal. but i skipped the prep work. and people told me to never skip the prep work. i didn’t research enough meals or have enough snacks on hand and i did not have things readily available so come dinner time it made it very difficult to do all the prep work first when all i wanted to do was eat now. and then i realized that while i was on whole30, my dad would be visiting from out of town for seven days followed by one of my closest friends visiting for four days right after. i know using them as an excuse is not ideal but i also know that i am always tempted by food especially when i’m in social settings. and when i can’t have whatever it is, i’m not always in a very pleasant mood. although i am no longer doing whole30 a hundred percent anymore, up until my dad came to town last week thursday, i stuck to a modified version of it. i made the exception of cheese, beans, and pita bread back into my diet so i wasn’t feeling constantly hungry. while i have company, i’m going to eat as best i can but i’m also not going to deny myself a cup of (good) coffee or a glass of wine or cheese or anything else. write out all my meals for the week. breakfast, lunch, dinner, any snacks needed, etc. even if it’s going to be the same thing for breakfast or lunch every day, i’m still going to put it on my weekly meal planner. prep all my food. wash and cut all my fruits and veggies, make lots of hard boiled eggs. ensure i’ve gotten everything from the grocery store i need before my next trip there. make a big batch of soup for easy lunches or dinners. grill chicken so i can throw it on top of salads. clean out the pantry of any temptations. now granted i do have young kids who like to snack on their crackers and cereal so obviously but i am going to get rid of all the food the girls normally wouldn’t eat. all of their snacks are going to go in a certain area of the pantry so the food isn’t cluttering every shelf. use a water drinking app on my phone to ensure i’m drinking enough water throughout the day. i feel like this will be much more manageable for me now that i am doing the prep work and ensuring that i succeed. at first i was really really disappointed with myself that i didn’t have it in me to stick to the whole30 plan but as i watch lara casey’s goal setting series, she mentioned that january is a great month to experiment with things that work and don’t work for you so you can set yourself up for success in the upcoming year. instead of simply quitting i’m choosing to believe i can do the whole30 (another time when my word of the year comes in to play), the beginning of january was just not the best time to choose to start. it can be very overwhelming with all the information that’s out there so i’m going to try to make this as least complicated as it needs to be. i’ll be updating weekly with how i’m feeling and what’s working for us! I really liked the twist to your post…not the usual perspective. Very good points and love how you adjusted to me your needs. Great job! I find that prep work is totally worth its weight in gold. Especially when you're trying to do a more whole food driven lifestyle. I love how you're doing your own version of the Whole 30! New Diet Taps into Innovative Plan to Help Dieters Get Rid Of 20 Pounds in Only 21 Days!